Two rectangular towers rise at the edge of Douglas’ Sandy Beach. Islands during high tide, these silent campaniles once provided air for men working the long tunnels of gold that ran beneath Gasteneau Channel. That was before April 1917, when a big spring tide broke through and flooded the mine. Two thousand men worked the mine, owned by John Treadwell. None of them died in the collapse. The mine once fed 900 stamp mines that ran 24 hours of day, reducing gold bearing ore to useable rubble. What wasn’t smelted was spread to form Sandy Beach. Stamp mill noise filled the air of Treadwell town where his 2000 miners lived. Today the house lined streets of Douglas and an alder forest have all but erased Treadwell. Aki and I are wandering the ruins. 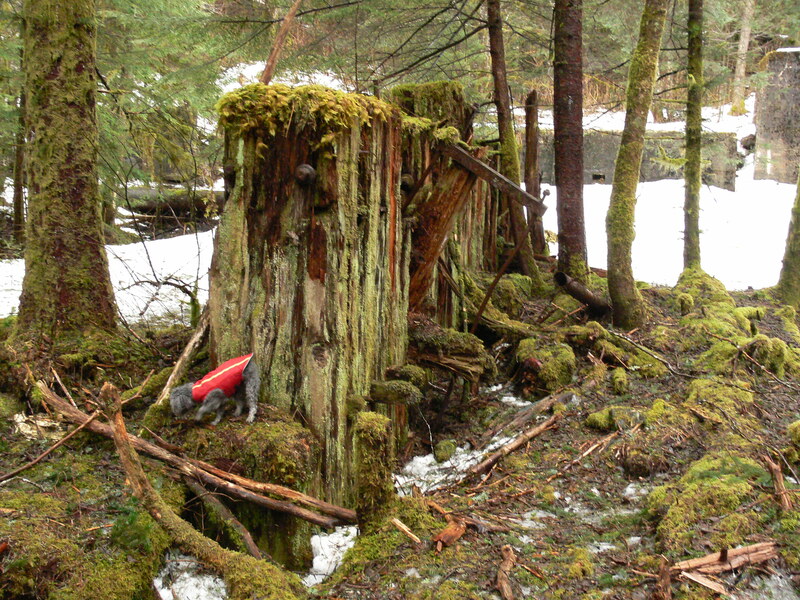 We expect to find these cast iron ruins — this ore car marooned in an alder grove and a large electric motor emerging from snow. The thick timber walls of the old stamp mill are a surprise. Even today they resist their still living cousins’ attempts to colonize. Aki finds little of interest but I indulge a fascination, made worse by imagination, with well made machinery. What giant dropped this ore car so far from a place it could be used? Did this huge iron gear fall from his watch when he smashed it on Mt. Jumbo? There are no giants here or even rabbits to grab Aki’s interest. We only find birds singing in an alder forest scattered with ruins. This entry was posted in Aki, Dan Branch, Juneau, Kwethluk, Nature, Southeast Alaska on March 30, 2011 by Dan Branch. Sometimes it is better not to know where the trail leads for ignorance increases the chance of adventure. This sunny morning we drive to Wolf Creek and start down what we thought was a 3 kilometer nature trail. Shoot, we’ll be back to the Whitehorse flesh pots in an hour. Two and a half hours later we are skiing on the edge of a Yukon River bluff not having seen another person since we left town. The hard packed track made an easy passage as we skied through a mixed pine aspen forest. We followed a widening Wolf Creek Valley, stopping often to check out wolf and moose tracks or aspen trees savaged by now sleeping beavers. Suddenly we break out of the forest and onto a narrow path that runs along the edge of a sixty foot bluff. The still frozen Yukon makes a sweeping turn toward a nearby mountain range. This world class stream passed by those mountains on its trip from the headwaters near Lake Bennett. Here we could have watched an endless parade of gold seekers on their way to the Dawson gold fields in 1898. Settling for a single snow machine track on the river’s ice, we turn down river for a long slog back to the car. Tomorrow we drive back to Skagway, making in a few hours, a trip that would have almost been impossible for the stampeders of ’98. Even taking advantage of the river, they would have taken months to make it this far from Skagway. 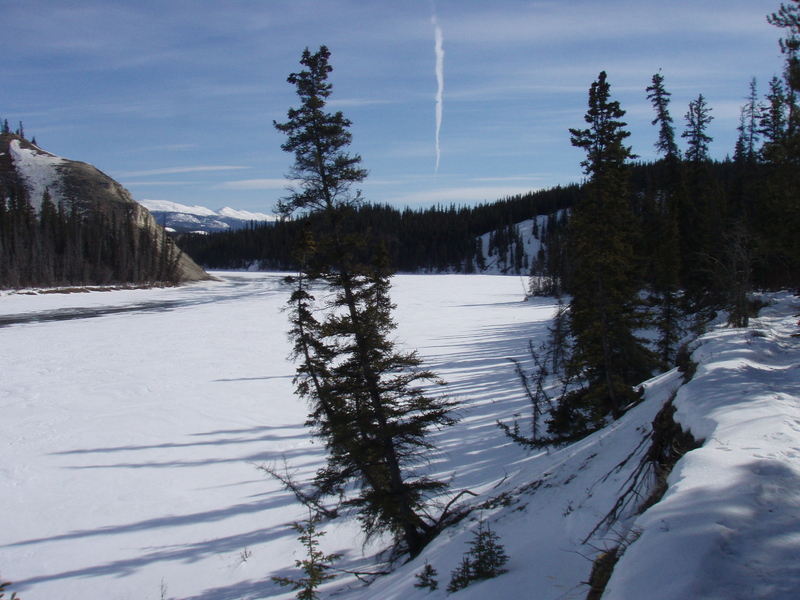 This entry was posted in Dan Branch, Kwethluk, Nature on March 27, 2011 by Dan Branch. In Canadian Tire we find a rack of thermometers and wonder at the number that also measure relative humidity. Why would anyone want one when they live in a shower stall. You wouldn’t find these dual meters in Juneau or Ketchikan. Then we look at one and find out how dry it is here in Whitehorse. Just 100 miles from our Southeast rainforest, these people live in a semi-desert. It shows in the quality of their snow and the trees that line the Mt. MacInytyre Nordic ski trails. That’s one of the reasons we make this spring pilgrimage to Whitehorse. That and the chance to eat Indian food, shop at Canadian Tire, and explore Canadian fiction at Mac’s Fireweed Bookstore. 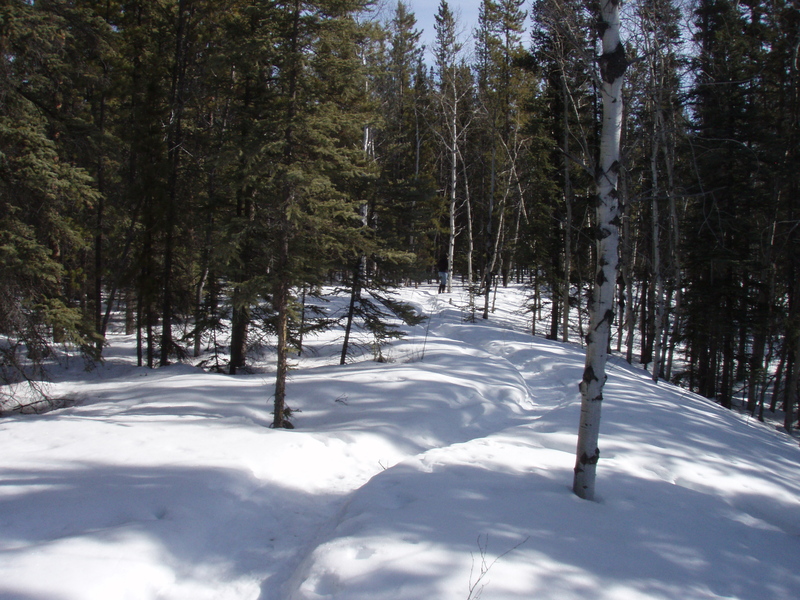 On Mount MacIntyre, groomed trails roll through lodge pole forests carpeted with snow crisscrossed by animal tracks. Most were left by large red squirrels but once or twice we passed lonely moose tracks. The uniformity of pines lead to day dreams that shatter when the trail drops into a knot of aspens. Even as dormant winter trees, the aspens’ black triangles on light gray bark add needed spice to this rigid green forest. 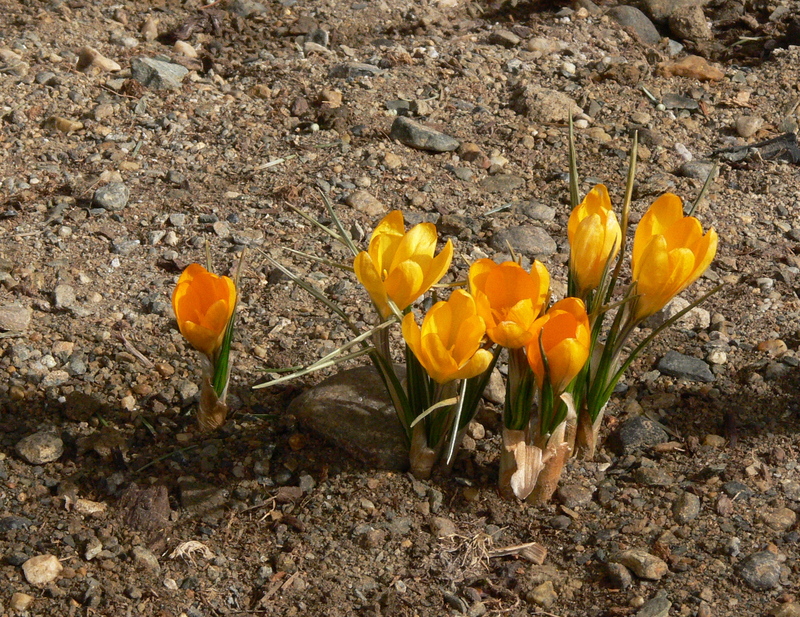 This entry was posted in Dan Branch, Juneau, Kwethluk, Nature on March 26, 2011 by Dan Branch. Aki is spending the weekend with friend Zoe so the human couple in her life grabed an early ferry for Skagway, Juneau’s closest portal on to the North American road system. 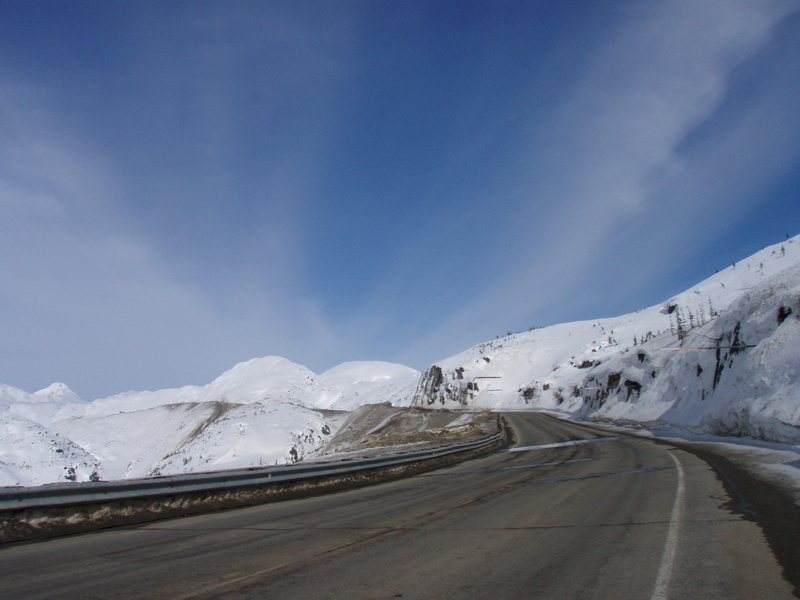 From there we drive up the dramatic White Pass and stop for a ski near the Yukon/British Columbia border. The road took us past avalanche zones that recently deposited great amounts of snow on the highway. The “Do Not Stop Avalanche Zone” signs confirm that it may soon happen again. It’s above freezing and sunny when we climb into the skis and cross the White Pass Railway right of way to a ski trail undulating through a Lodgepole Pine forest. Plaster white mountain domes appear above the forest on every horizon. We turn back after reaching a long flat valley seasoned with scattered pines. It reminds me of Juneau’s own high pine meadows, framed as they are with rugged white mountains. Skiing farther would take us to the ruins of the winter community formed by the thosands of men that rushed to the Klondike gold fields over one hundred years ago. After hauling thousands of pounds over the Chilcoot Pass they spent the winter of 1898 here sawing Ponderosa Pines like these into rough lumber for rafts or boats. When the ice broke on nearby Lake Bennett they loaded a year’s worth of gear into makeshift vessels and floated down to the Yukon River and then on to the Dawson. This entry was posted in Aki, Dan Branch, Kwethluk, Nature on March 25, 2011 by Dan Branch. This entry was posted in Dan Branch, Juneau, Kwethluk, Nature, Poetry, Southeast Alaska, Uncategorized on March 23, 2011 by Dan Branch. Wind blows hard into our faces here at sea level. We start climbing anyway to reach some open muskeg meadows. A passing dog walker warns that it will be whippy “up top.” Last month we might have turned around but it looks like winter has packed up for the year, leaving behind this sunny warmish day. Wind no longer delivers pain. Several feet of snow still cover the land but it is slowly collapsing from within. It has no chance against the lengthening days to come. Yesterday’s thaw followed by last night’s freeze set up the meadow’s surface nicely for us. Aki dashes in zig zags through the shore pines until she fines fresh deer tracks. I join her and look at the sharp edged gashes made this morning by a large deer’s hooves. Spring can’t come soon enough for him. Later we find older tracks of a wolf who might be searching for the deer. Sunlight reflecting off the field of snow makes me lazy so I close my eyes to listen. This is a dessert for birds and therefore quiet so Aki’s footfalls sound like those of a trotting horse on the snow crust. When she settles beside me there is only the wind blowing over my ears and the trees. It makes sound but no music. Sometimes it mimics rushing water and other times, a jet engine. Each tree is a cello’s string and the wind the bow. Ironically wind only produces music when moving over man made things like power lines. 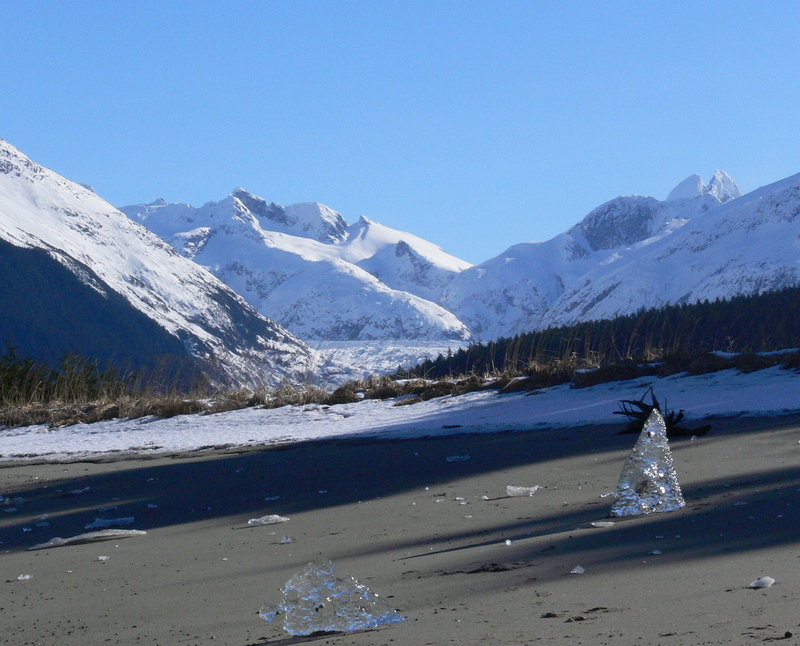 This entry was posted in Aki, Dan Branch, Juneau, Kwethluk, Nature, Southeast Alaska on March 20, 2011 by Dan Branch. Aki likes this kind of day with a sun delivering enough warmth for spring. We walk along a riverside trail, passing a sun flooded meadow. Its stream curves sensuously towards us with banks made feminine by a rounded blanket of snow. Springs in the rocks lining part of the trail have weeped water all winter that froze into translucent walls of ice. At two places seeping water makes the trail impassable with slick ice. We leave the trail for the river bank below with its snow load now covered with a thin crust of brackish ice left by last night’s equinox high tide. It feels like spongy vinyl under foot until we break through to the heavy wet snow below. With now wet feet I stand in the sun and watch a wall of mountains rise into blue across the river. They hide the Herbert Glacier now but we will see it when we reach the beach. We hear new bird songs and the indistinct sound of distance surf when emerging from the forest to a dormant wildflower meadow. Here is the river delta revealed at low tide, a disturbed Lynn Canal and the Chilkoot mountains beyond. (brown, green/blue, white, then azure). Here, also, is a strong gusting wind that makes Aki stop and start like a counter punched fighter. Once again we lean into the wind and find a wide sand beach littered with clear ice sculptures. One sports a round hole in its middle that frames the promised glacier when used from one side and the Benjamin Island Lighthouse in a whipped sea from the other. I feel sorry for exposing Aki to the wind until she gives me the, “where is my flying toy” look. She longs to dash down the packed sand chasing her frisbee. The toy is back home so I toss a stick which she retrieves like a labrador until exhausted. This beach and the other wild places we visit formed Aki. She remembers summer trips here chasing her frisbee. She will be the first to find the trail through the sand berm that leads home. I long to be formed by this place too. 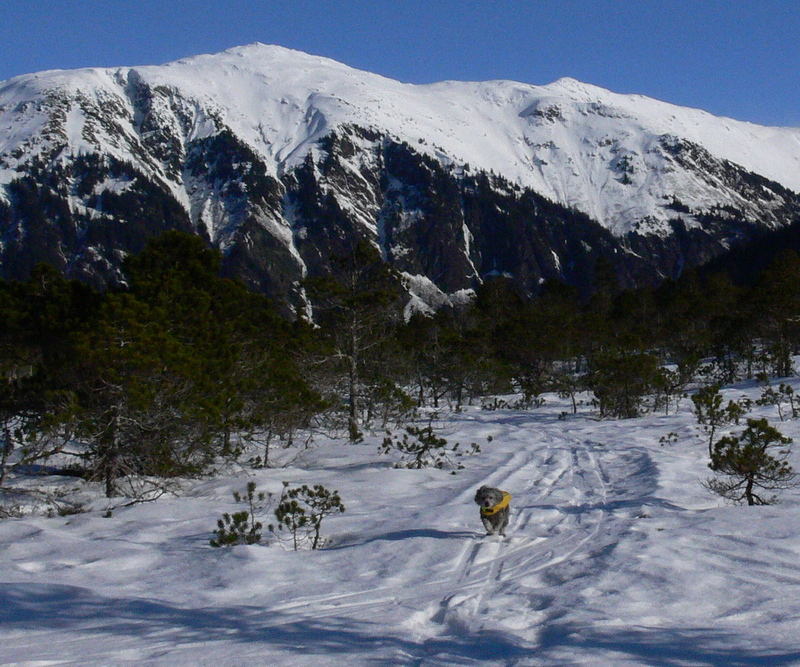 This entry was posted in Aki, Dan Branch, Juneau, Kwethluk, Nature, Southeast Alaska on March 19, 2011 by Dan Branch.